Charlotte's premier country act is Early Ray! To have only been playing 3 years, this energetic young act has already made a huge impact on the scene! Often compared to contemporary acts like Zac Brown Band and Jason Aldean, they can also scale their show back to a more throwback style in the vein of Old Crow Medicine Show and Mumford and Sons. Depending on what your needs are we can arrange the band and set to fit any occasion. The band's approach is to invite you along and to be fully interactive with the party. Every song in their set is a sing- a-long classic that your crowd will enjoy! From Garth Brooks, Alabama, Hank Williams to current favorites Eric Church, Zac Brown, Jason Aldean etc. Early Ray will have you singing, dancing and having a blast! Knowing that not everyone may not know the country hits, Early Ray has taken it upon themselves to countrify many popular songs from other genres. Everything from Cee-Lo to Guns n Roses to Michael Jackson and Prince! There won't be anyone left out of the party! Their set list of over 300 songs grows weekly. Got a special request song you wanna hear? Don't be afraid to ask! Early Ray is a full production ready band with full lighting and PA in house and ready to go. Depending on your needs we can arrange the band from solo acoustic all the way to a 6 piece full production. 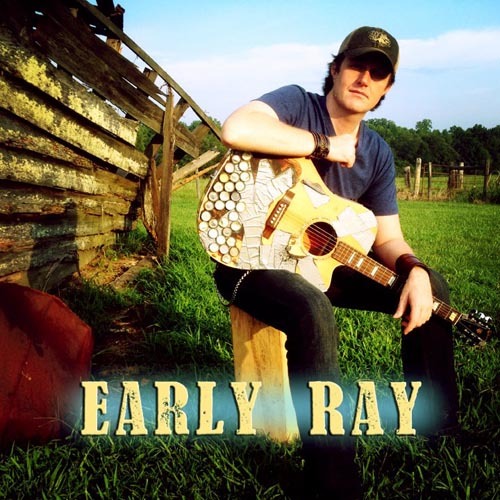 Early Ray released a cd of original music in June of 2012 and it charted at #38 in the Country charts and top 10 in the Country EP charts. Videos for their songs "Where The Wild Things Are" and "Fried Pickles" are currently in rotation on the GAC (Great American Country) network. Their single, "Fried Pickles" is in current rotation on XM country radio. They have played along side major acts such as Dierks Bently, Charlie Daniels, Pat Green, Montgomery Gentry, Kip Moore, Tate Stevens, Corey Smith and more!